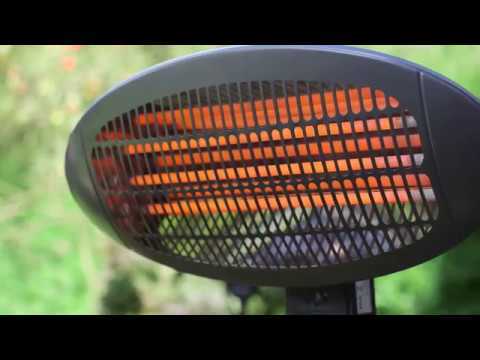 Keep warm when outdoors with this powerful, 2000W floor-standing adjustable patio heater from Garden Glow. If you enjoy relaxing in the garden, then this patio heater will help you to make the most of outside spaces even in the evenings when the temperature drops. Electric heaters have many advantages; because they don’t have any flames or burn oxygen they are much safer than gas heaters or fire pits and can even be used indoors. In addition to being safe, they are also a source of light, heat a wide area, are silent and virtually maintenance-free. The powerful heater has two heat settings, allowing you to choose the temperature required without wasting any energy. Choose from 1000W or the maximum of 2000W, perfect for keeping you warm on colder evenings. The innovative design is height adjustable from 1.9m to 2.065m, making it perfect for extra warmth whether you are sitting or standing. Constructed from durable steel, this heater is sturdy and safe, and even comes with a base and rubber feet for extra stability. This base will prevent the heater from falling over and if it does get knocked there is an automatic switch of function, helping to keep anyone around the heater safe. Quick to heat up, the adjustable floor standing patio heater is the perfect addition to ensure you enjoy your garden to the fullest.